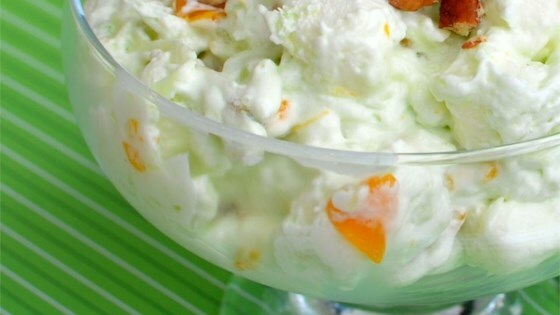 "This is a light and fluffy dessert salad based on pistachio pudding; the pudding is made lighter with the addition of whipped topping. Add an extra can of mandarin oranges, if you like." Dump instant pudding into a large mixing bowl. Add pineapple, and mix well. Mix in whipped topping. Stir in bananas, marshmallows, fruit cocktail, and mandarin oranges. Cover, and refrigerate until thoroughly chilled. A tip: IF YOU DON'T WANT THE BANANAS TO TURN BROWN SOAK THEM IN THE PINEAPPLE JUICE AND ADD A SPLASH OF LEMON JUICE WHILE YOU PREPARE THE DISH. I promise they will not turn brown. I really liked the flavor of this salad, I left out the pineapple, I think I'll leave it in next time. Also some nuts would be swell too.